I've realized I'm really lazy when it comes to crafting. I mean...don't get me wrong, I start off all ready and able to do a big DIY or whatever...but then about an hour into it, if I'm not done or almost done...I start to fade away. That's probably why all my big crocheting projects are like...half way finished. I have a few of them too- just laying around, eyeing me whenever I walk by, shaking their heads in disappointment. I really should get to those, just bite the bullet and finish. Another thing- craft projects that need a lot of components or space to do! I'm like, really not into all of that hoopla. I want to whip out any and all craftiness from a pair of scissors, tape, MAYBE glue, washi tape (lots of washi tape), and on my dining room table. That's why I have "projects" like this and this under my sleeve. Simple and lovely. And please spare me the use of a glue stick; that's almost the lamest thing I can think of. Seriously, what's the point of those things? To get cat hair stuck to all of your fingers? To frustrate you an hour later when something falls off of something else because the glue isn't sticking anymore? ALTHOUGH I do like watching the glue go from purple to clear. That's pretty neat. I'm like a little kid- if it doesn't happen my way I fold up my arms and huff off to my room. ...Where I then go on Pinterest and pin a million more BIG craft projects and furniture upgrade DIYs. Goodness gracious woman. So, you definitely won't be surprised to hear that this next craft project I did with a friend involved 2 COMPONENTS! Bwahahahahahaha! Take THAT Martha Stewart! No, don't take THAT....I love you Martha. Everything you touch or do amazes my eyeballs beyond belief. Also, thank you for combining two of my favorite things into one- office supplies and your lovely brand. I am in love with every single Avery thing you've done! 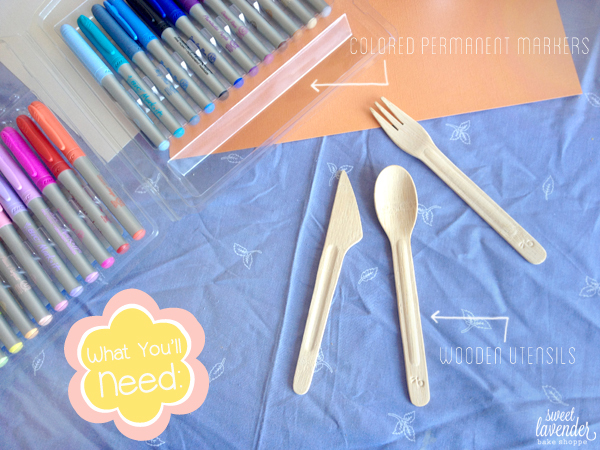 That's right...you'll need TWO lovely things: Colorful permanent markers AND your favorite wooden party utensils. I think I bought mine at my local Sprouts Market. Ahhhh simplicity. 3. Color your heart out. Fin. 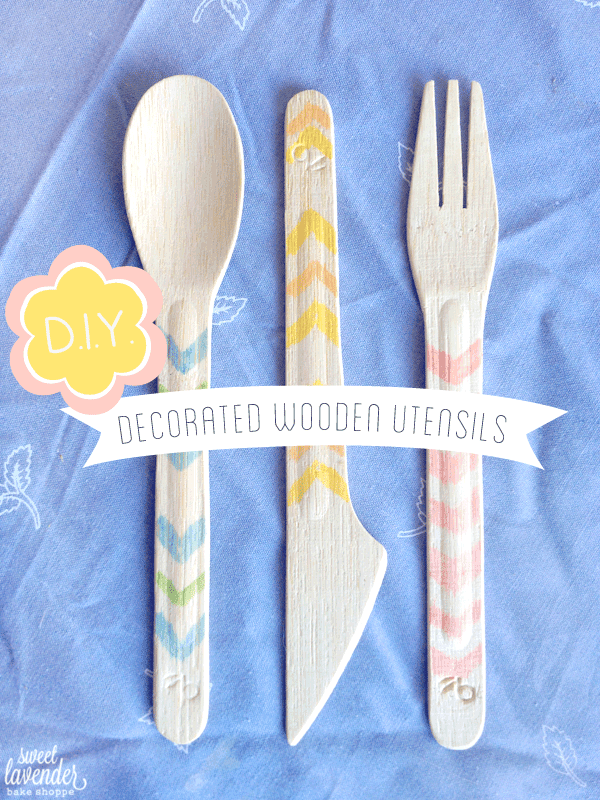 My friend and I went with the overexposed Chevron Stripe design on half of our utensils. Because, like I've always stated- I'm a lover of fads. Then! Wait for it, waaaaait forrrrr itttttttt- We switched it up (woah now) and did the other half in sweet little polka dots. We're crazy, I know. 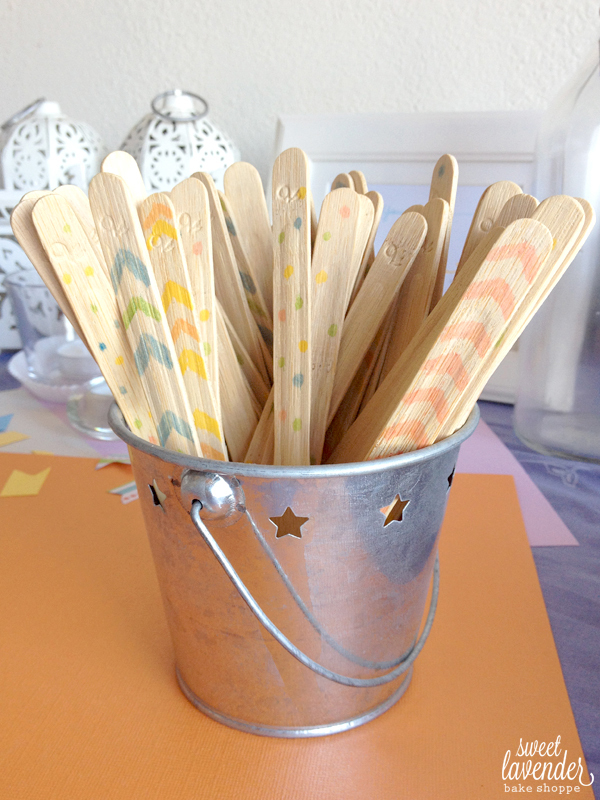 Here's my only caution- because the markers we used are not edible (as with most permanent markers), please keep your decorating madness to only the part of the utensil that will be held. Keep away from any part that might touch food or mouths! 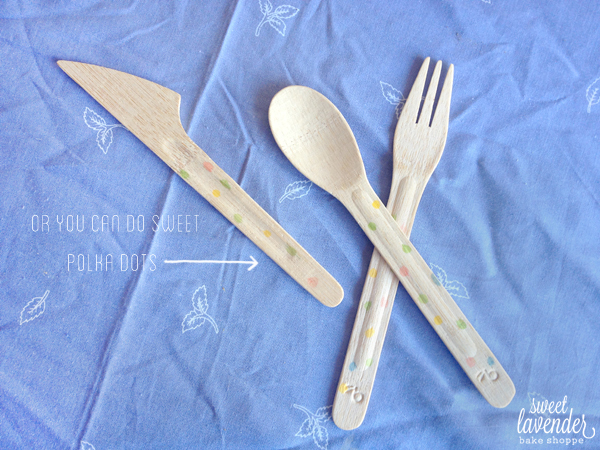 Also, my utensils were not coated with anything (I don't know- maybe you'll see some that are coated? )- so the marker design sort of soaked right into the surface. Totally cute and perfect for any summer party or picnic! wow, love this!!!! What a great idea, simple, beautiful, unique and easy. Thanks for sharing!!! These are so so cute! I love them! The patterns are just lovely:)!